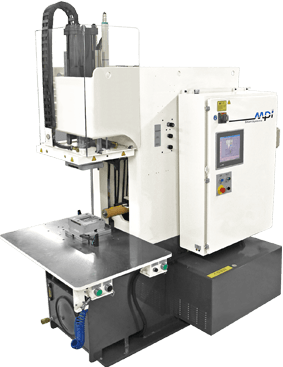 The MPI 56 is engineered specifically for operation with thick viscosity, abrasive mixtures used to produce ceramic cores, ceramic parts, and MIM (metal injection molding) patterns. The MPI 56 features easy maintenance and fast material changeover. 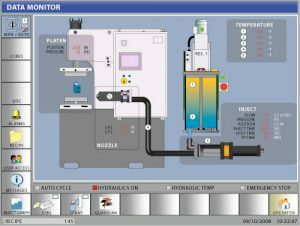 Precise temperature control prevents binder separation and a unique injection valve system reduces wear. The MPI 56 is designed to meet all your thermoplastic binder, abrasive material injection needs. The MPI 56 is available with clamping force of 25, 38, 50, or 100 tons. An impressive list of standard features and a wide range of options are available. Our engineering support staff is prepared to help determine the configuration that will meet your needs and optimize your throughput. The proprietary design of a sliding spool transfer valve reduces wear of the injection piston and injection valve. Less wear means more throughput and less downtime. Easy removal of the mixer motor assembly for reservoir clean out and mix hangeover.